A month has now passed since the publication of ‘Time to Deliver’, the NHS vision for progressing the ‘Five Year Forward View’. While the latter was launched with great fanfare, you could be forgiven for having missed the debate and discussion around the former. Yet ‘Time to Deliver’ is arguably just as important, perhaps more so for those organisations and individuals tasked with introducing such fundamental healthcare reforms. ‘Five Year Forward’ set out the challenge to close three gaps in health care: the care and quality gap, the health gap, and the funding and efficiency gap. So how does ‘Time to Deliver’ develop this important consensus around the future healthcare challenges into actual action? Closing the care and quality gap will focus on the development and implementation of new care models to raise care quality levels across the health service. With an emphasis on clinical networks, there is a clear drive to move health and social care out of silos and into partnerships. A programme of support is being provided, in addition to investment from the dedicated Transformation Fund. Within this, there will be a particular focus on effective new models for treating urgent but non-life threatening conditions outside of hospitals, and workforce development to facilitate delivery of new care models across the health service. In addition, an emphasis is being placed on narrowing the gap between the best and struggling organisations to reduce variability across the NHS. With one third of services still requiring improvement, there is much urgent work required under the auspices of a proposed new ‘Success Regime’. Preventative measures form a key strand of the ‘Five Year Forward’ vision, with an emphasis on ‘bending the curve’ of future healthcare trend projections to moderate a forecast rise in demand. A new National Prevention Board, chaired by Public Health England, will spearhead this increased emphasis on prevention. Their initial focus will be on diabetes, with the condition and complications already consuming some 10% of the NHS budget. The roll out of a Diabetes Prevention Program across seven demonstrator sites will be the first step in upgrading these prevention efforts, with obesity likely to be another priority area to follow. Perhaps the most discussed part of the ‘Five Year Forward View’ was the ambitious target to achieve an extra 2-3% average annual net efficiency gain during this period. 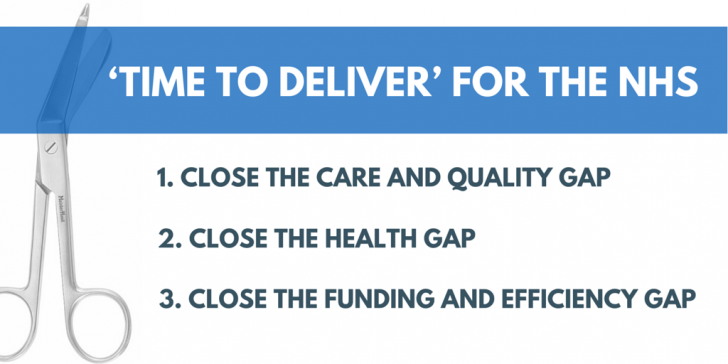 ‘Time to Deliver’ devotes the most attention to this, outlining three main areas where the NHS will be taking action: preventing and managing demand, maximising value through driving up productivity and efficiency, and redefining services to provide joined up care in the most cost-effective ways. The report is clear that some issues are best achieved through collective action involving public, private and third sectors. A national blueprint will not be developed for these, rather, key elements will be developed to support local solutions. Novel methods for identifying the small number of patients that consume disproportionate resources in order to address these are an example of new innovations in this area. Perhaps most central of all is the plan to examine current patterns of expenditure in an effort to address unwarranted variation. Benchmarking costs will influence spending patterns, and increasing efficiency and productivity transparency will mirror recent efforts to provide similar information on the quality of care. As should be expected with such a broad and far-reaching report, many areas will require further exploration to establish the detail. From an organisational perspective, how will public, private and third sector bodies be brought in to work alongside existing healthcare services? From a workforce perspective, how will healthcare workers be supported to change their current service delivery? Their training rightly concentrates on clinical competence. Incorporating workforce development into this is a very different skill, yet without clinical engagement, any service redesign will struggle to make an impact. From a transformation perspective, how will payment incentives be set and used to accelerate this, and what efficiency and productivity measures will determine these? Closing the health gap is an essential aspiration that needs to be realised in order to address future demands for healthcare. Yet a month is a long time in politics, and while ‘Time to Deliver’ reinforces the NHS commitment to becoming a service that prevents as well as treats illness, financial reality is now seeing the NHS in England cutting the local council public health budget by £200m. These are just some issues that serve to illustrate the tip of the implementation iceberg – how such wide-reaching reforms will ultimately be introduced largely remains to be defined. ‘Delivering Together’ is the mantra that closes the report, through partnerships with patient groups, front line staff, social care, local partners and Government, business and representative bodies all contributing towards this. These stakeholders now need to work together to answer these questions and establish how best to implement these changes. An initial cohort of ‘Vanguard’ organisations, together with their partners, will champion this new vision for healthcare. But even in these leading-edge groups, re-designing public services will require considerable support. The report itself acknowledges the good source of independent advice and delivery support provided by external consultancies, while emphasising the need to ensure the best value-for-money is being delivered by these. As a consultancy dedicated to the reform of the public sector, IMPOWER is well placed to deliver this, providing deeper insights, stronger relationships and better collaboration. With an established track-record of addressing complex problems in health and social care, IMPOWER looks forward to working with NHS organisations to ensure they optimise their ‘Time to Deliver’.